My goodness, Easter is upon us and here I am doing my first Easter post. 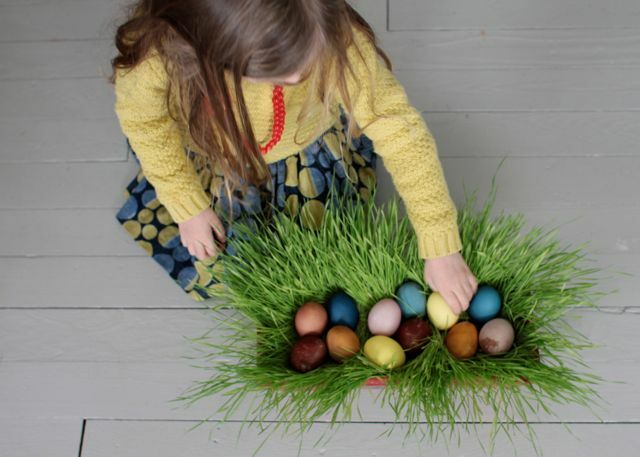 I apologize for not getting to this sooner, but you still have time my friends to make natural dye and colour eggs before Easter Sunday! 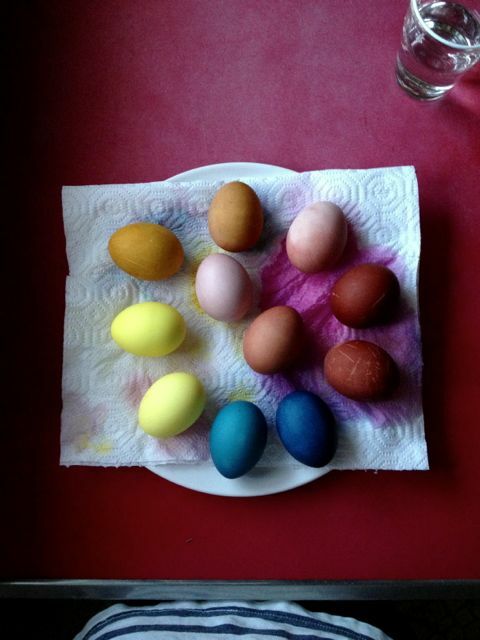 This was our first time making our own dye and colouring eggs naturally. 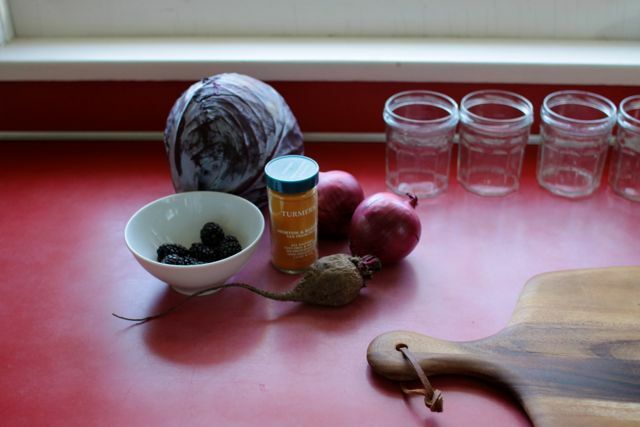 I have purchased natural dye in the past, or just used artificial dye, such as here and here. This year I wanted to extend myself. Part of my personal shift to honor the environment and increase my earth friendly ways. 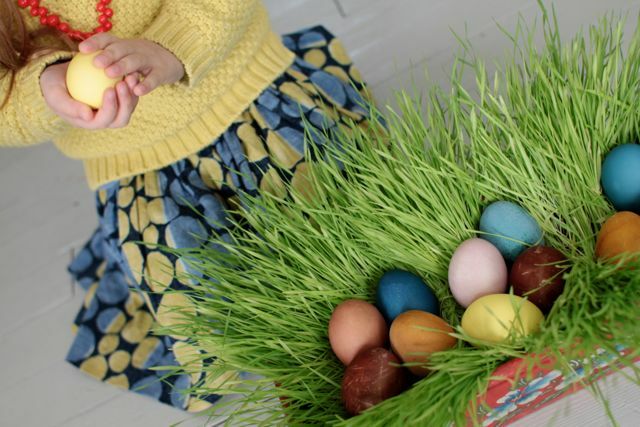 This year natural dyed eggs was a number one activity on my Easter project list. Oh how rewarding it was! It feels like this will be an annual part of our Easter celebration. I enjoyed the process (although our house smelt like I was making sauerkraut) and adore the results. Our Easter eggs are just gorgeous. 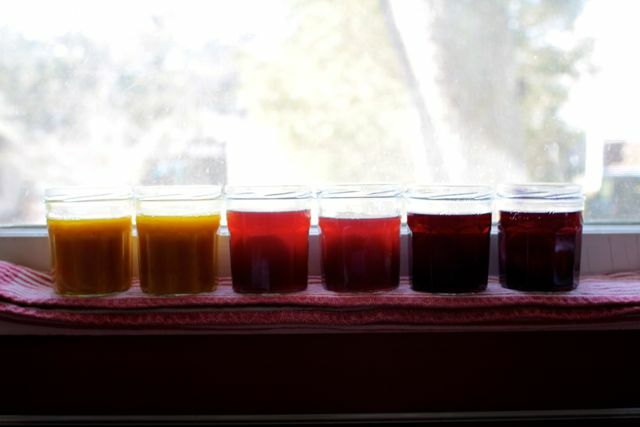 I did a little research on the web, and generally everyone was using the same things to create natural dyes. 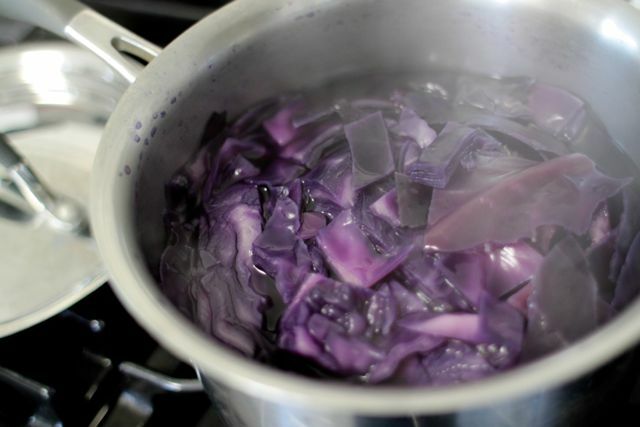 The best results seemed to be with red cabbage, turmeric, beetroot, and onion skins. There were a few other things to try also, but I felt like for our first time making natural dye, this was enough. I also tried blackberries, but did not see the result I was expecting and so I combined the beetroot and blackberry dye mixtures. I added enough water to cover eggs in a medium pot and boiled each item, with the eggs. I figured the egg boiling in the solution would help enhance the effects. I boiled the eggs for 12 minutes. I then strained the solution into small glass jars. I added a tablespoon of white vinegar to each jar, and let the eggs soak individually one egg per jar. Some eggs sat in the solution for hours, and some of the eggs sat over night. I dyed some without boiling the eggs in the solution, but I made sure the eggs went straight from the boil, while they were still very hot, into the solution. I think hot eggs take in more dye. 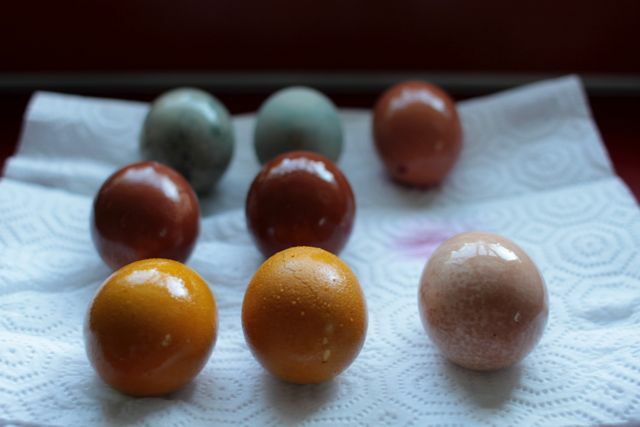 When removing the eggs, you have to be careful not to damage the dye coating, it forms a very thin film over the egg and if you let it be, it dries, and you obtain the richer colour. This part is really important to achieve eggs like mine. I used a spoon to take them out of the solution and then lay then gently on paper towel and did not touch them until they were dry. If you smudge or wash the eggs, you will have mottled or light coloured eggs. I washed one, but did not like it so much. This I learnt from trial and error. You can see that some of mine are touched and bumped, smudged or washed and some are not. 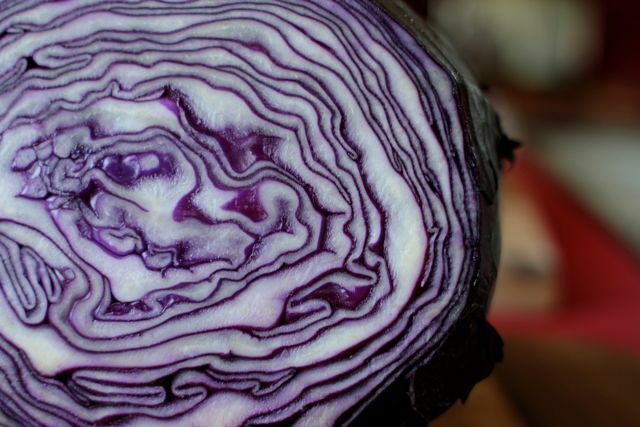 The red cabbage makes the most dramatic transformation. If the egg is left to sit for a long period of time it creates a rich, deep blue, which is really a lovely colour. I boiled the outer half of a small cabbage. 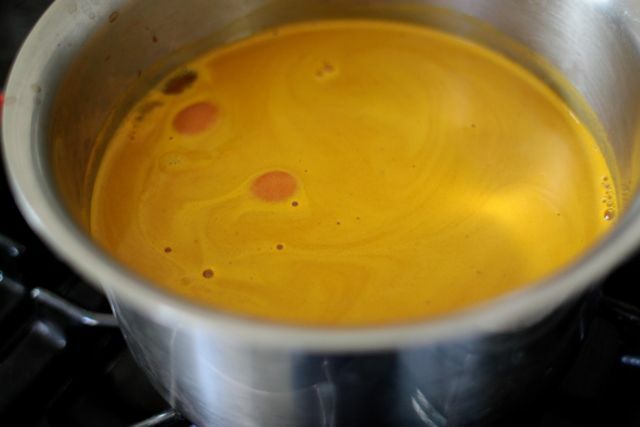 The turmeric makes a lively sulfur yellow. I used 4 tablespoon of turmeric. I can’t get enough of the yellow and blue together. 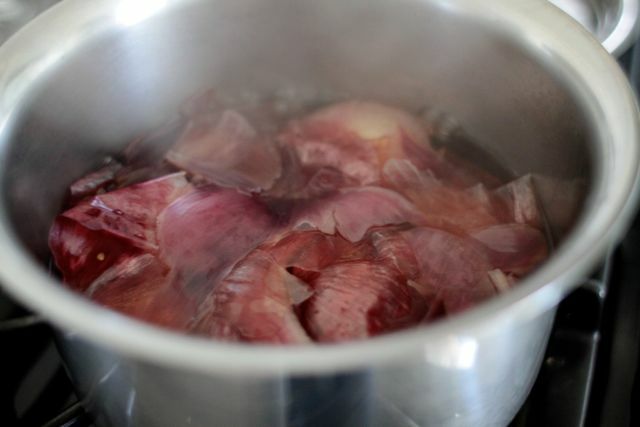 The red onion made a reddish brown, and the beetroot made pale pinkish lavender. I used only two onion skins and only one small beetroot. Maybe with a more intense solution the colours would have been richer. I just used what I already had in the fridge. We used both brown and white eggs to achieve colour variety. 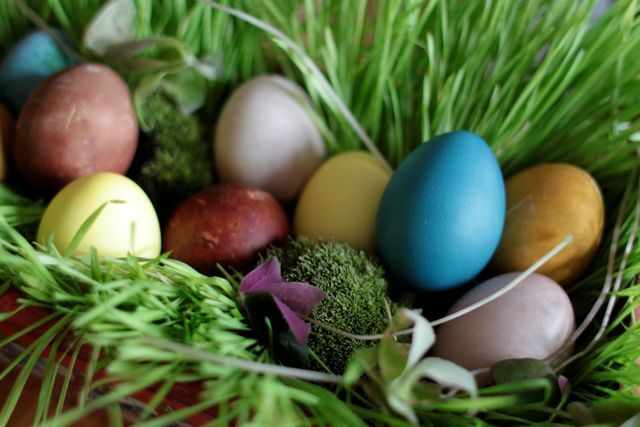 The dye colour of the white eggs are more vibrant, while the brown eggs give muted tones. I am really happy with these earthy hues, I could not have achieved these gorgeous colours with store bought dye. 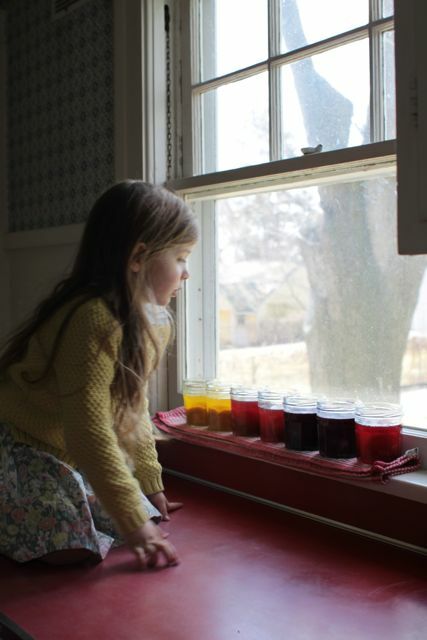 I love that the process taught the girls about making and mixing natural dyes from things right out of our fridge and cupboard. 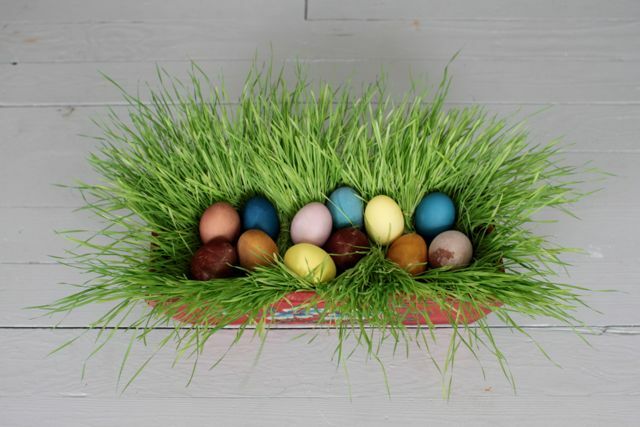 Elle created this beautiful center piece for our table with wheatgrass, eggs, moss and clover. We are so inspired, and so very glad Spring is here! 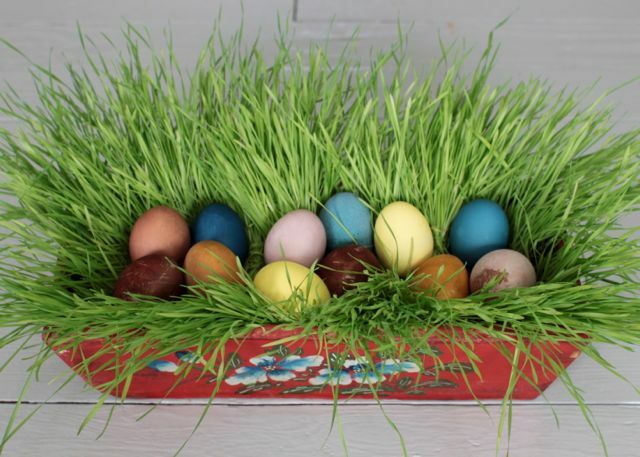 This entry was posted in C E L E B R A T E, C R E A T E and tagged consumer conscious, craft, easter, spring. Thanks for posting this Kirsten. I’m eager to try it! 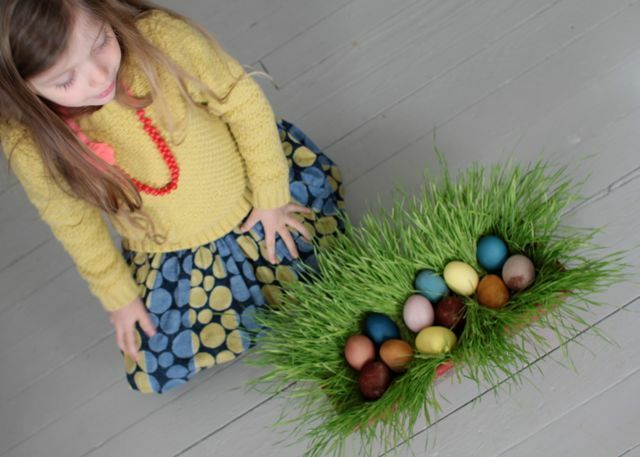 Rachel I am so pleased you have grown wheat grass basket this year! Yay! It makes me so happy to know it will be adored by your family.